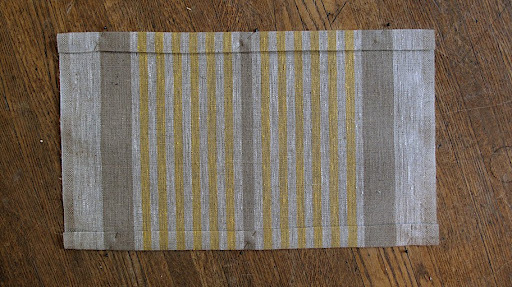 I found this striped, rustic linen while buying fabric for projects that don't exist at Gray Line Linen in New York City. It's got a wide weave, it sheds a little like burlap and how can I deny the goldenrod, stripe. When can I ever deny goldenrod? 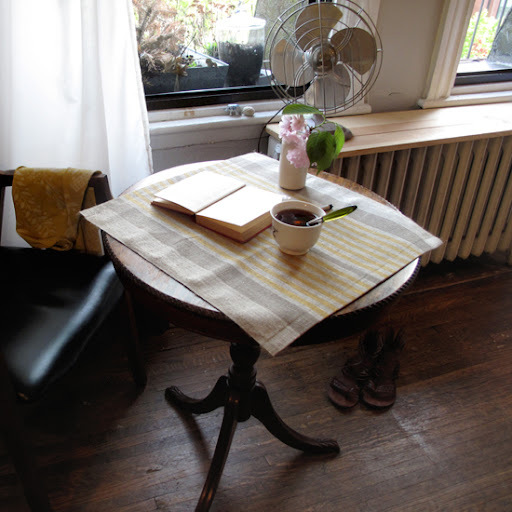 I decided to make a table top/placemat sort of thing to feel better about having bought it and it's been sitting out, staring at me: you bought me, now do something! After I made these I started on another project, what was to be a fantastic small floral tie belt - then I sat up at my little sewing table - apparently not having backed up enough and flipped the table which threw the sewing machine to the floor breaking important plastic parts and misaligning the entire body. Look for a post on buying a sewing machine. Just look at that. What else is there but linen? 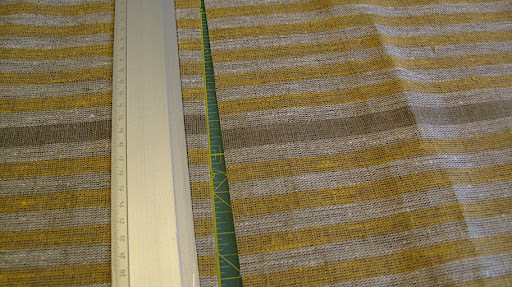 This fabric has a finished edge and is 20" wide so you'll just need two of the edges. Cut a piece 15" long. Cut yourself some nice clean edges. Next, fold the raw edges in half an inch, then again another inch. 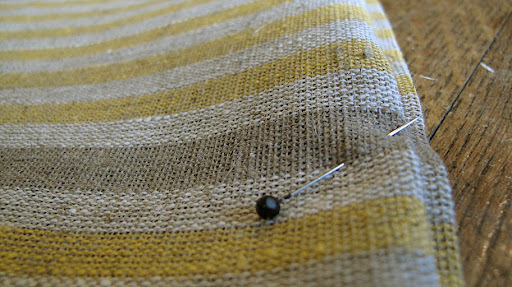 Flip to create the fold you need to do a blind stitch (more details here). I prefer a blind stitch most always, but certainly in this case I didn't want to distract from the stripes and texture of linen. If you prefer to do a top stitch, though, skip this step and continue with the top stitch. When you're done press, and then, well, you're done. I used the rest of the fabric and did the same thing and ended up with a 20" x 20" square - to use for something. And yes, then you can sit right here and enjoy tea, plums and a book just like I did, I really did. A bottle of Hendrick's gin I see? The best!